The British Weather – A Risk Worth Taking ? We are always disappointed when a client cancels an order for one of our temporary roadways, (or indeed for any of our kit) but when the client cites the “current warm weather and the long range weather forecast” as their reason for cancellation, we can’t help but take a very sharp intake of breath! OK, so maybe (just maybe) we won’t experience the wet weather like we did last year, but to predict that the British summer will be completely dry is, in my very humble opinion, a very risky thing to do. 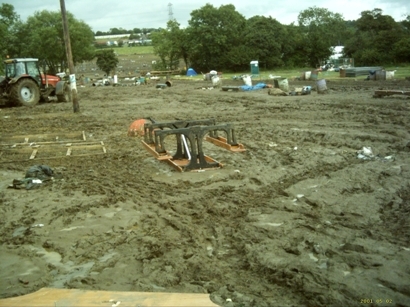 I have had the privilege of being a visitor to many open air festivals and shows and therefore I can speak with some experience of how just a light shower combined with the patter of many feet, will soon turn a previously nice, dry grassed area into a sticky mud bath. Not good for the punters and definitely not good for the organisers or owners of the land. Last year was manic; many clients were ordering twice, sometimes three times the number of our ground protection plates (Trax Panels) for their event – just to ensure that their event went ahead. Judging by the amount of panels that went through our cleaning machine, they were all well used; we also had a few “your panels saved my event” type comments! Without wanting to be accused of touting for business, I think that trusting to luck with the British weather is being a little ambitious to say the least. Even if you plan for no rain, it is still advisable to have some roadway or walkways in place; if nothing else it will guide your punters safely around the event site and should the inevitable happen …………………. well at least you are prepared. I shall be looking closely at the weather for the event that has cancelled this order and please allow me a little smirk if it tips it down, or (more likely) they come onto us at the last minute screaming for our kit. We will of course, (being a very responsive company), bust a gut to sort them out, but a “told you so” will be uppermost in my mind! It’s shaping up for a busy summer season of events; let’s hope we all have fun and stay dry (sic). PS I have just ‘Googled’ “UK Long Range Weather Forecasts” and most only go up to 30 days. So if your event is in June onwards then you really are in the lap of your God!